Delicious Orange Cranberry Scones make a delicious Christmas morning treat. Or Thanksgiving. Or New Years! Really any day of the year you will love this easy scone recipe! Spruce it up for the holidays with a little egg nog for an even richer, creamier taste! 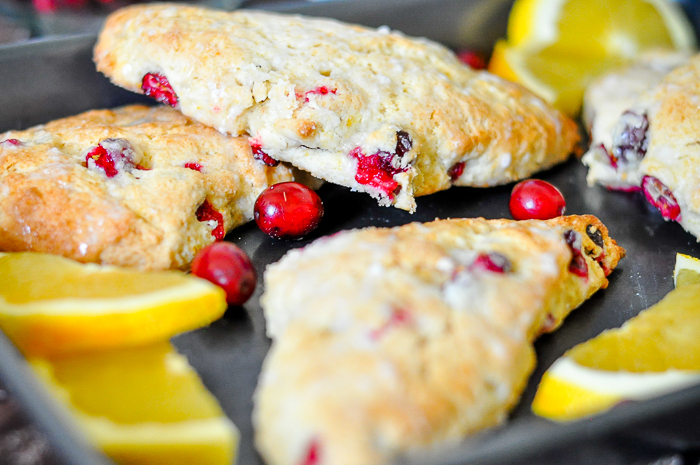 Fresh Cranberry Orange Scones that will impress your brunch or holiday guests!! Alright Nerds, it’s December. How are we doing? Are we surviving the holiday season? I think all of us tend to get a little stressed and overworked this time of year. Long to do lists, extra events taking up free time, and lots of deadlines. As the years pass, we’ve definitely been trying to scale down our responsibilities during the holiday season. We start our shopping early, turn down opportunities that cause more stress than excitement, and focus on time together as a family with a Christmas Advent Garland filled with fun family holiday activities. No matter what the holiday season looks like though, it always seems to involve a few activities that require baking which is why these Cranberry Orange Scones come in handy! The fresh cranberries in these scones are tart with a subtle sweetness that comes out while being baked! Add in the sweet citrus of orange and creamy egg nog or milk for a balanced scone you’ll love! 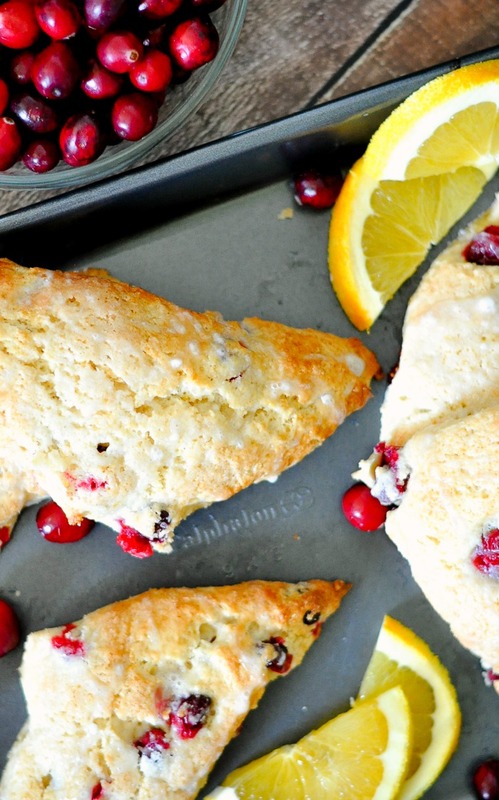 Even people who do not love cranberries will love these scones! I didn’t really grow up loving cranberries, but I have become a big fan of cranberry and orange together over the years. It”s such a bright and happy flavor combination for a cold winter morning, pairing sweet and tart together! It was the perfect winter Christmas scone to add to my scone recipe collection! DO I HAVE TO MAKE THESE SCONES WITH EGG NOG? The simple answer to this question is no, you don’t. You can simply do an equal substitution for milk. I will tell you personally though that I am not a fan of egg nog, and you will probably never see me drink it during the holiday season. I will, however, cook with it! Adding egg nog into this scone recipe also makes it a little more festive for Christmas breakfast! Plus with being able to bake these ahead of time with no work the morning of and enjoy alongside a warm cup of coffee or hot chocolate, you really can’t get much better than this for a holiday morning. 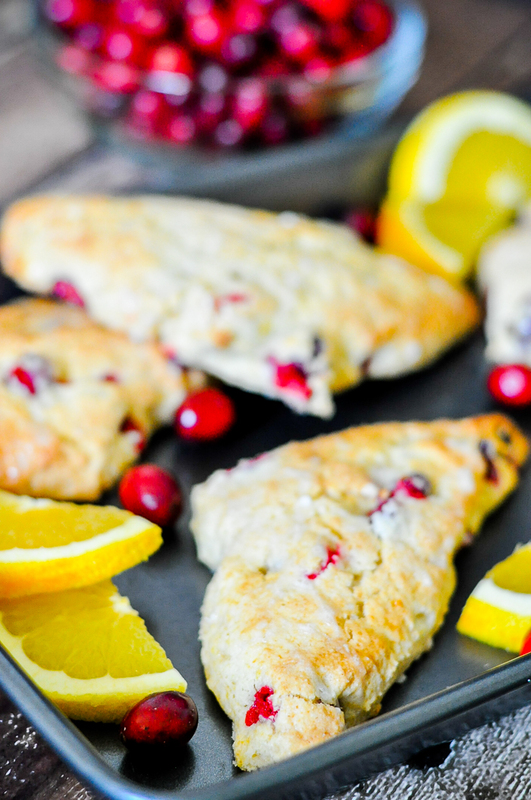 HOW TO MAKE ORANGE CRANBERRY SCONES? I hear from a lot of people that scone recipes are intimidating to make, and I was once that person! Let me reassure you that you can make these, especially if you let go of some perfectionist tendencies. Yes, the dough is wet and a bit messy. Just go with it! Cover your hands if desired, use plenty of flour and embrace the stickiness. In a large bowl, add flour, baking powder, salt and zest. Then, add in grated butter and use a pasty cutter, fork, or your fingers to thoroughly combine the butter into the flour mixture. . In a small bowl, whisk together the cream, egg, sugar, and vanilla. Then, add to the flour mixture and toss together until everything appears evenly moist. Next, gently fold in the cranberries. Do NOT overwork the dough! Now to the sticky part! Flour your hands and the working space to work the dough into either a long rectangle or round circle. Your choice! I normally choose a long rectangle, cutting the down in half to create two squares and then cutting those squares into 4 pieces with an X. A sharp pizza cutter is the easiest tool to use for this! When ready, place scones at least 2 inches apart on a parchment lined baking sheet. Bake for 17-20 minutes or until lightly golden and cooked through. Let them cool before adding glaze! WHY DO I GRATE THE BUTTER FOR THIS SCONE RECIPE? I find that grating the butter is the easiest and fastest way to get the butter incorporated into the flour mixture. You can’t melt the butter for scones; you need it cold and incorporated into the dough. Freeze your stick of butter ahead of time and use a sturdy grater on top of a cutting board. Easy peasy! HOW TO INCORPORATE BERRIES INTO SCONES? When adding fresh berries, use very cold berries for your scone recipes. I normally place them in the freezer ahead of time. Next, avoid over mixing or pushing on the dough. It’s something I learned from making my Lemon Blueberry Scones. It’s okay if one or two berries breaks; nothing bad will happen! Plus it will naturally happen to one or two berries when they cook or when you cut them anyway, so don’t get too hung up on smushed berries. Your guests will love this scone recipe either way! When adding fresh berries, use very cold berries and don’t over mix or push on the dough. It’s something I learned from making my Lemon Blueberry Scones. It’s okay if one or two berries breaks; nothing bad will happen! Plus it naturally happens to one or two when they cook or when you cut them anyway, so don’t get too hung up on smushed berries. Your guests will love this scone recipe either way! This silicone baking mat is amazing for making scones because it works as both a pastry rolling mat with measurements and a baking mat that helps with clean up! It helps especially if you want to roll the dough out into a round shape as it has shape lines on the mat for you. If I don’t use the mat above, you can use other non stick silicone baking liners or parchment paper on your baking sheet. For prepping the dough, a Pastry Scraper and Cutter can come in handy though I prefer using a sharp pizza cutter to do the actual cuts. In working with the glaze, I find Pastry Brushes and an angled icing spatula are most helpful. 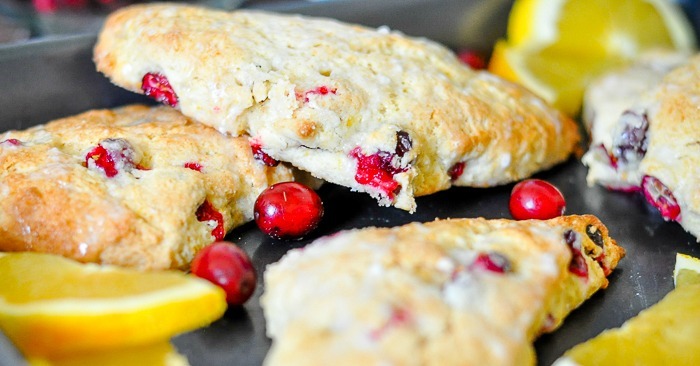 LET’S BAKE THESE DELICIOUS ORANGE CRANBERRY SCONES! Preheat oven to 400 F, and line baking sheet with parchment paper. In a large bowl, combine the flour, baking powder, salt, and zest. Grate the frozen butter into the flour mixture. I use my large box grater and a cutting board for grating the butter. Toss butter into the flour mixture and combine it with a pastry cutter, fork, or just your fingers. In a small bowl, whisk the cream, egg, sugar, and vanilla together. Add to the flour mixture and then toss the mixture together until everything appears moist. Slowly and gently fold in the cranberries. Do not overwork the dough! This part is a bit sticky because the dough will be wet. Flour your hands and the working space and then work the dough into either a long rectangle or a round circle. If a long rectangle, I usually cut in half and then cut the two halves into 4 pieces with an X. If a circle, cut into 8 equal wedges. I like using a sharp pizza cutter for this process. Place scones at least 2 inches apart on the parchment lined baking sheet. Bake for 17-20 minutes or until lightly golden and cooked through. Remove from the oven and allow to cool slightly before adding glaze. For the glaze, combine the powdered sugar and orange juice. Drizzle over scones.